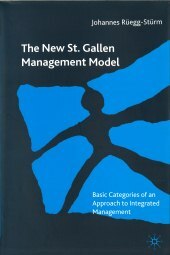 The New St. Gallen Management Model contributes to a systemic management theory and practice. It thus follows the tradition of the St. Gallen systems approach, which has played an important role at the University of St. Gallen since the pioneering work of Hans Ulrich. According to the linguistic philosopher, Ludwig Wittgenstein, the meaning of words does not rest in the words themselves but in how they are applied. This holds true for management terms. This book should not be seen as a business management encyclopaedia full of isolated, final definitions. Instead, this new work embodies a form of thought and a search grid that will facilitate the understanding of the complex challenges of managing purpose-oriented social systems within their universal context. It does not convey short-lived management recipes, but instead offers a solid understanding of the central management fields of decision-making and action. It serves to support leaders in overcoming complex management challenges as well as students in deepening their understanding of the fundamental questions and challenges of business management.